One of many campaign cars for a Workers’ Party city council candidate in Niterói, near Rio de Janeiro. Last fall’s Brazilian presidential election exposed deep rifts in the country’s political and social landscape. The animosity demonstrated by the candidates — who included the incumbent, Dilma Rousseff of the Worker’s Party (PT), and Aecio Neves of the Brazilian Social Democracy Party — in nationally televised debates was mirrored by ordinary citizens on the street. The country is clearly suffering from dramatic socioeconomic inequalities and widespread public discontent. Almost 10 percent of its 200 million residents live in urban slums wracked by violence and infectious disease. In 2013, the country was brought to a standstill by protesters incensed by crumbling infrastructure, corrupt politicians, and disreputable public security forces. Further, Dilma’s first term was marked by economic stagnation. The recent bankruptcy of construction magnate Eike Batista, who at one point was the eighth wealthiest person in the world, is emblematic of the country’s economic struggles. The ruling party has also been implicated in vote buying and corruption scandals that have seen indictments but no jail time. The combination of social unrest, inequality, and economic woes led to an extremely interesting and competitive election cycle. I arrived in Rio de Janeiro in early September, just as the campaigns were reaching their peak. In Brazil, voting is compulsory, and it seemed as though everyone was willing to voice his or her opinion. Every day, the city’s iconic beaches were lined with supporters waving oversized, brightly colored flags (blue for Aecio, red for Dilma) and handing out campaign paraphernalia. A steady stream of inane campaign promises and obnoxious jingles blared from loudspeaker-mounted cars, overwhelming the normal urban symphony. These sounds were mixed with those of angry motorists as they honked and demonstrated their displeasure with the traffic. Many of my professional colleagues — members of the “old left,” who contributed to the fall of the military dictatorship in 1985 — dreaded the possibility of Neves’ election. They claimed that Neves would repeal the conditional cash transfer programs that have been vital to the emergent middle class. On the other side, Neves’ supporters argued that these programs were a form of vote buying, which created a needy welfare state. As the runoff election approached, even The Economist weighed in, arguing for Neves’ election, claiming that it would improve Brazil’s tanking economy. Walking down the street without being handed pamphlets for both candidates became nearly impossible. Reading the candidate’s policies as an outsider, I could barely perceive an ideological difference. Neither described any plans to repeal or augment cash-transfer programs, and neither had laid out any policies to address the drivers of last year’s protests. Worse, they both planned to continue denuding the world’s largest carbon sink, the Amazon rainforest, whose disappearance has been linked to the crippling drought in São Paulo, the continent’s largest city and home to 20 million people. 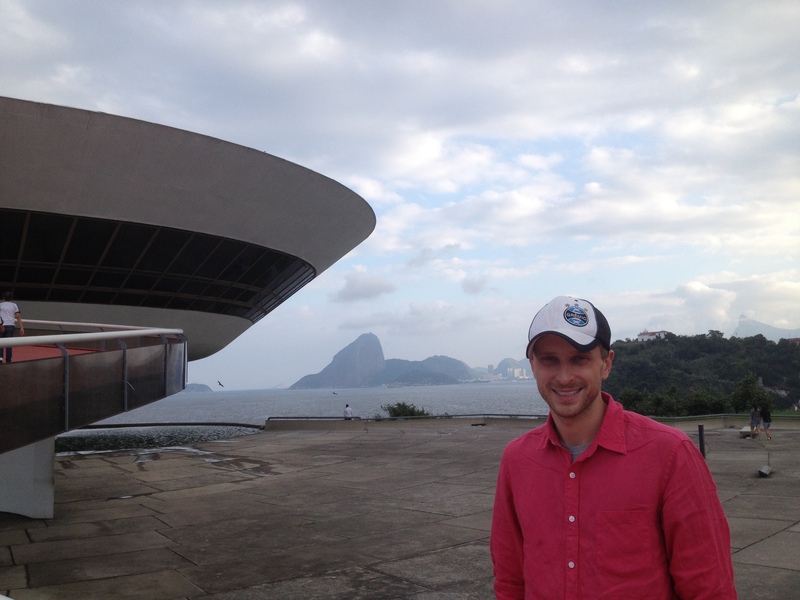 Robert Snyder in Niterói, Rio de Janeiro state. Ultimately, Dilma won by a margin of less than 4 percent. Some of her opponents reacted to her reelection with derision or derogatory and racially motivated comments about her Northeastern power-base. Despite a new presidential term and promises to renew the economy, recent news has focused on the discovery of a “super-bacteria” in Rio’s fetid Bay of Guanabara or on widespread corruption and participation by the country’s police in the booming drug trade. If Dilma is to secure her legacy and cement Brazil’s role as a strategically important trading partner for other members of the G-20, her regime and the Brazilian ruling class must address the issues underlying the country’s economic, social, and political divides. Robert Snyder is a Ph.D. candidate in Epidemiology at UC Berkeley. This entry was posted in Berkeley Student, Brazil and tagged Aecio Neves, Brasil, Brazil, Dilma Rousseff, presidential election, PT, Workers' Part. Bookmark the permalink.